I like books, oh my goodness I like books, I read all the time. If I don’t have a book to read I get highly annoyed with life and worry that I might attack someone. Reading doesn’t come easy for me but the challenge is a challenge accepted. I enjoy it because I get to go to so many different places. I feel like I get the chance to understand things I never thought I would understand. I get to go inside someone else’s world. Its an amazing thing. How we get the chance to read, we get to be someone else for a day, for an hour, for a moment in time your life is left behind and you are reading a book. I know the world is a big place with lots to see and lots to do, but when you pick up a book you get to see and do things you might never get the chance to do. I love books. I’m thankful for all the books. I like real life books and I like fantasy books, I like books on real people who have lived before, I like books about animals, and I like books with lots of random photos. The first time I read Anne Frank I cried. It was the first book to make me cry. The first time I read Each Little Bird That Sings my world changed, I had been going through something in my life like the girl in the book. I understood her and I felt like she understand me even though she wasn’t real. I felt not so lonely. My librarian who knew me by name when I was in living in Seaboard a small town full of older people who all loved me, the library was a happy place for me. I hear its that way for a lot of people. The first time I read Twilight I didn’t think this is corny I thought this is like a weird way of writing a story. I fell in love with Bella because she thought like me. And the first time I read New Moon I called my sister Vana like nine times during it and went on about how much Bella was just like us. It was a strange thing yet she understood. Books take you to other world. They make the world different and I love it. When I read Sarah Dessen books I can’t help but love everything about it. I fall in love with each and everyone in the book. 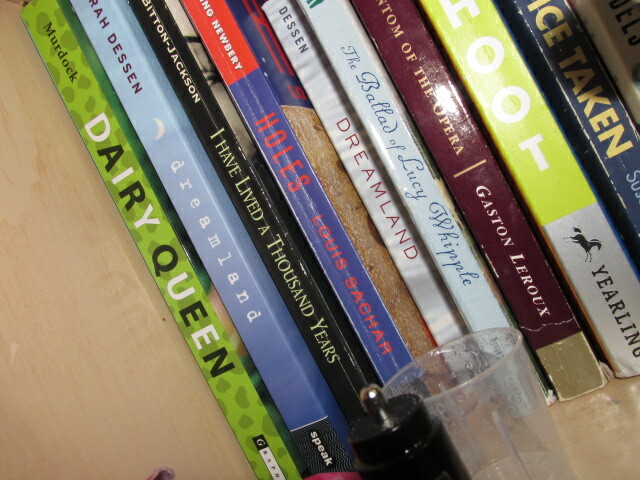 Some of the places Sarah Dessen has set her books have been places I’ve been and that made me feel so amazing. When I found the book How NOT To Be Popular in 2009 I laughed out loud while reading. I felt so much emotion. Its still to this day one of my top favourite books. I adore it with my soul Its amazing. Hoot, Holes and Because Of Winn-Dixie are some of the books that I fell in love with first. Hoot because it was amazing story with loves of weirdness and so much love. Holes because it took me to all kinds of places and I loved to go somewhere I had never been. And Because of Winn-Dixie because I had a small dog with a cute smile and who hated stormy weather. I’m thankful for books. Because without them I would have never left a house in Paris at Half past Nine I would have never put my left foot, right foot, right foot, Right! I would have never walked to grandma’s house through the woods, I would have never been to Hogwarts. I would have been to Chicago in the future. I wouldn’t know words and names that mean more me to me. I wouldn’t be someone who can say lines from books, be someone else for an hour. So I’m gonna go and get lost in a book. I’m gonna go and become someone else for two hours and when you see me again maybe I will understand someone else better..